The Ambanis Have Arrived For Nickyanka's Cocktail & We're Loving The Bright, Happy Colours! We've hardly gotten over DeepVeer and we already have another mega-celebrity wedding before us. Jodhpur's Umaid Bhawan Palace is all set to welcome the guests on behalf of desi girl Priyanka Chopra and American singer Nick Jonas. The first guests have already arrived. Nita Ambani and Mukesh Ambani have landed at Jodhpur airport along with their daughter Isha Ambani and son Anant. 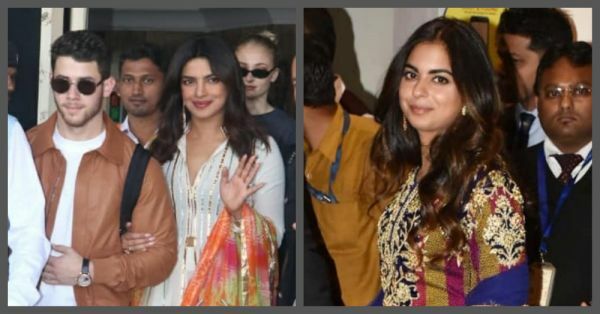 Paparazzi got a glimpse of the Ambani's who were dressed in colourful ethnic wear for NickYanka's pre-wedding ceremony. While Nita Ambani chose a pink and white lehenga, Isha Ambani, who will herself be a bride soon outshined in a mutli-coloured sharara. Accompanying the Ambani's was also Radhika Merchant, rumoured to be Anant's girlfriend and soon-to-be the choti bahu of the family! We can't wait to see the rest of the guests. Stay tuned to this space for all the updates!